Japan is in the grips of an unprecedented heat wave, with temperatures soaring past 100 degrees Fahrenheit in an island nation that rarely experiences that level of warmth. 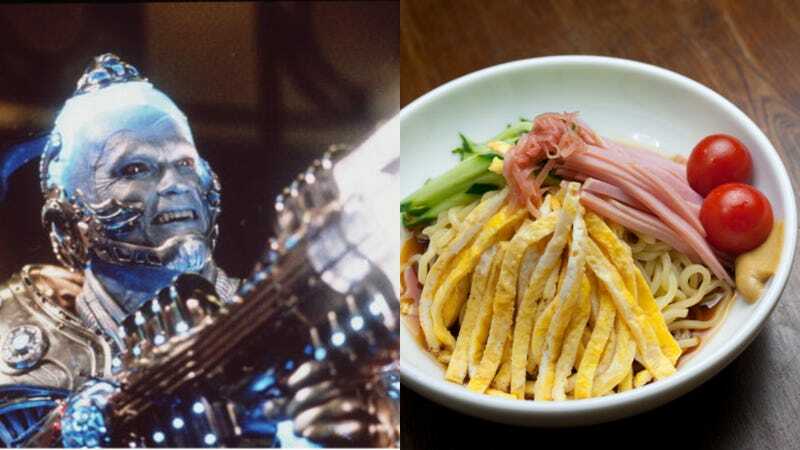 One karaoke bar/restaurant called Pasela is offering an intriguing remedy, with its version of hiyashi chuka—the refreshing cold ramen dish popular during summer—but chilled at -79 degrees Celsius (that’s more than -110 degrees Fahrenheit). UPDATE: Beloved Takeout commenter PalestinianChicken points out that this dish is actually Jiro-kei, a style of ramen that in the words of PC is “one of the most disgusting things I’ve ever put in my mouth... it consists of poorly-cooked thick noodles, flavorless cuts of thick chashu, a mountain of bean sprouts, garlic, fried bits of batter, and thick but unappetizing broth.” I mean, I’ll still eat it. How does it even get that cold? According to Japan Today, the chilled noodles are served from a box outfitted with dry ice, a blue light for effect, and plays music that serves as a “dramatic fanfare to your meal’s arrival.” This noodle dish, we’re told, is dressed with chashu (fatty slabs of pork), deep-fried red peppers, veggies, and given a good squirt of sansho peppers and Japanese mayonnaise. Surely you’re paying up the wazoo for such gimmickry, correct? Not really. Pasela is offering this for 980 yen, or a reasonable $8.85 in U.S. dollars.